(a) When the head is stationary, the cupula of the crista ampullaris remains upright. (b) When the head is moving rapidly, the cupula is bent, opposite the motion of the head, stimulating sensory receptors. Sagittal section of the closed eyelids and the anterior portion of the eye. Fibers of the levator palpebrae superioris muscle arise from the roof of the orbit and are inserted in the connective tissue of the upper lid. When these fibers contract, the upper lids are raised and the eye opens. 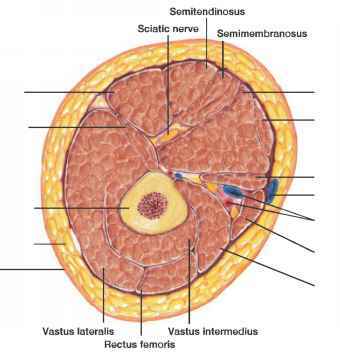 The connective tissue layer of the eyelid, which helps give it form, contains many modified sebaceous glands (tarsal glands). Ducts carry the oily secretions of these glands to openings along the borders of the lids. This secretion helps keep the lids from sticking together. 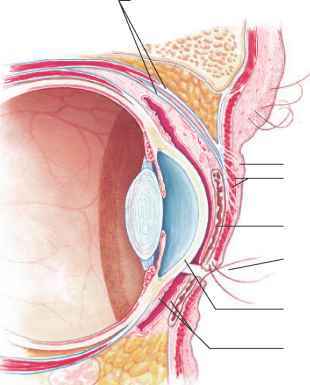 The conjunctiva is a mucous membrane that lines the inner surfaces of the eyelids and folds back to cover the anterior surface of the eyeball, except for its central portion (cornea). Although the tissue that lines the eyelids is relatively thick, the conjunctiva that covers the eyeball is very thin. It is also freely movable and quite transparent, so that blood vessels are clearly visible beneath it. A child in school with "pinkeye" is usually sent straight home. Bacteria cause this highly contagious form of inflammation of the conjunctiva, or conjunctivitis. Viral conjunctivitis is not usually contagious. Allergy or exposure to an irritating chemical may also cause conjunctivitis. The lacrimal apparatus consists of the lacrimal gland, which secretes tears, and a series of ducts, which carry the tears into the nasal cavity (fig. 12.24). The gland is located in the orbit, above and lateral to the eye. It secretes tears continuously, and they pass out through tiny tubules and flow downward and medially across the eye. The lacrimal apparatus consists of a tear-secreting gland and a series of ducts. the medial borders of the eyelids. 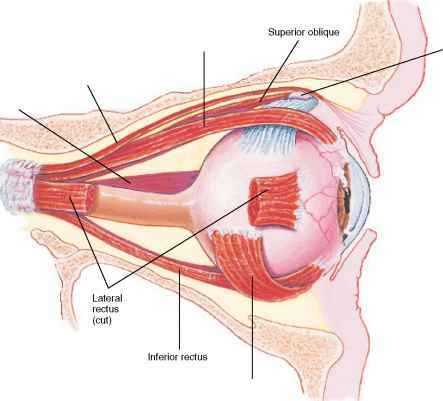 From these ducts, the fluid moves into the lacrimal sac, which lies in a deep groove of the lacrimal bone, and then into the nasolacrimal duct, which empties into the nasal cavity. Glandular cells of the conjunctiva also secrete a tearlike liquid that, together with the secretion of the lacrimal gland, moistens and lubricates the surface of the eye and the lining of the lids. Tears contain an enzyme, called lysozyme, that has antibacterial properties, reducing the chance of eye infections. Tear glands secrete excessively when a person is upset or when the conjunctiva is irritated. Tears spill over the edges of the eyelids, and the nose fills with fluid. When a person cries, parasympathetic nerve fibers carry motor impulses to the lacrimal glands. 1. Superior rectus—rotates the eye upward and toward the midline. 2. Inferior rectus—rotates the eye downward and toward the midline. The extrinsic muscles of the right eye (lateral view). Note the pulleylike trochlea that the superior oblique passes through.